Extra-thick pieces make these wooden puzzles just right for young children. Theyre easy to handle quick to solve and filled with colorful artwork in favorite themes. 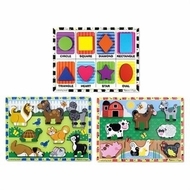 This bundle by Melissa & Doug features Shapes Pets and Farm Animals. Each puzzle has 8 pieces and encourages hand-eye fine motor and creative expression skills.